The illustration left, shows, from top to bottom, 7 resource efficiency methods with decreasing cost-effectiveness and increasing environmental impact. 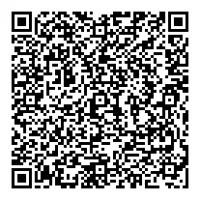 (Click on the thumbnail for a more detailed version of this image). Clearly the most desirable and value-creating approach is to remove the need for a resource, or to reduce or minimise use as far as practicable. The next method, to “re-source“, meets the remaining need with a material with a lowest ecological impact. We then get into how we handle waste. Reuse in the same process is better than recycling or “down-cycling” into a different process. If neither can be achieved, it may be possible to recover some part of the waste – for example converting embedded energy into heat by burning waste. The least desirable option is to reject or dispose of the waste into the environment. Where disposal to the environment is the only alternative, then preferably the waste will be a nutrient for a biological process, such as compostable food packaging, or it will be inert. The worst case is where the waste has potential to cause harm, in which case it may need to be contained, treated or diluted to reduce the environmental damage. The widths of the segments in the diagram above reflect the value the methods offer. Removing or reducing the resource saves their full costs, while reuse and recycling return some of the investment in the resource. End-of-pipe disposal usually comes at a net cost – not only is the intrinsic value in the resource discarded but there is often further cost for treatment or landfill. 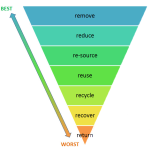 This diagram uses the waste hierarchy, which has been around for decades in various forms. The difference is that I have added one method – “re-source”, which reflects the goal to reduce the impact on the environment from the resources that we use. In this extra method, once we have removed or minimised our need for a resource, we then consider alternative resources with a better ecological efficiency. For example if our resource is electricity, we should first start by employing every practical alternative to reduce its use and only then find out if we can source the electricity from an alternate supply with lower ecological impact, such as a renewable source. Using harvested rainwater water instead of treated water is another example of re-sourcing. Some organisations behave as if the “re-source” choice is the only method they should use, so they will buy 100% renewable energy and declare “problem solved”. This approach can be much less cost effective for the organisation, as it does not lessen demand for the resource and because substitute sustainable sources are often more expensive. Also, in a world where renewable supplies do not satisfy total demand, the extra resource that this organisation gets from renewable sources reduces that available to other organisations. Nevertheless this approach persists because it is seen as being lower effort than the alternatives, especially were the resources involved are a small part of the organisation’s input costs. There is more on this topic in my article about why certainty influences choices. Multiple methods in the resource efficiency hierarchy tend to be applied in sequence, so the use of the resource is first minimised, then some material is recycled and the remaining waste disposed of. Unfortunately end-of-pipe solutions still dominate waste management in many organisations because waste is often seen as a “problem” that needs dealing with for consent reasons which leads to a tendency to use a technological “quick fix”. This is simply a matter of perspective: the visible waste output is seen as the problem rather than reducing the resource input. 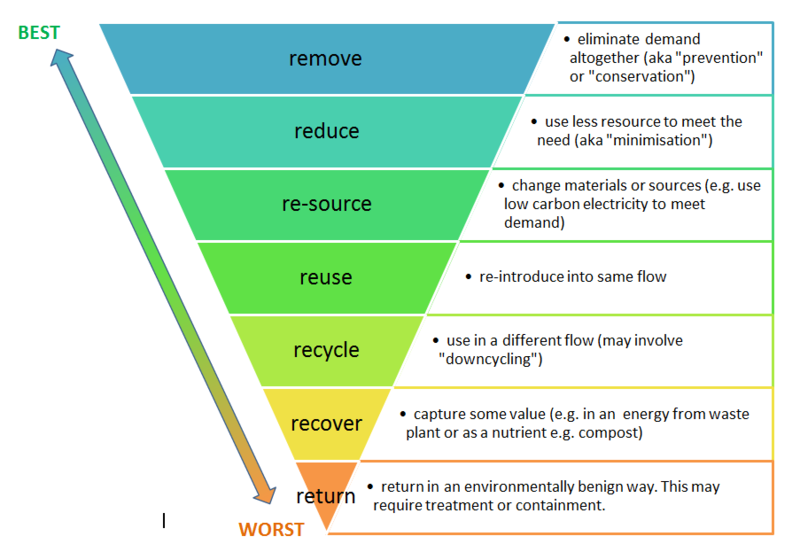 The resource efficiency hierarchy stresses dealing with the root causes of the waste, such as poor operations or poor product design, which causes the waste to arise in the first place as well as eliminating barriers to reuse, such as poor segregation of waste, rather than the end-of-pipe treatment. 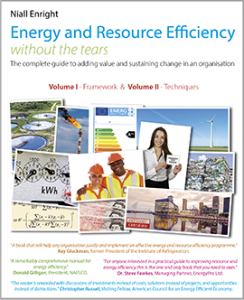 It is sometimes helpful to look at organisational policies around waste to align these with the resource efficiency hierarchy. For example I worked with French cosmetics giant L’Oreal on some resource efficiency audits in the US and Europe and discovered that it was the policy that any non-product materials that left the site were categorised as waste. L’Oreal are to be applauded for using this strict definition of waste in their reporting to encourage the sites to eliminate all forms of waste. However this definition had the unintended effect of making it preferable to burn waste in a biomass boiler on site as the emissions to air are not counted in waste reports. Prior to this definition, the waste from the shampoo lines was sold in bulk to nearby car wash companies who would use it to clean cars – thereby displacing their need for “virgin” detergents and no doubt leading to some very classy finishes on the local cars! This form of recycling is higher up the resource efficiency hierarchy but L’Oreal’s definition of waste unwittingly led to the lower recovery choice being favoured. Although a bit clumsy these “7Rs” remind us that reducing demand is always a better strategy than improving the quality of supply (i.e. lowering environmental impact) of a resource. The best resource to use is no resource at all. Amory Lovins coined the term negawatt to describe this most valuable resource – a watt of power saved. Niall, I’m not sure I agree that Reduce is always preferable to Re-source. Take the following example: I use 100 kg/day of a chlorinated solvent. Let’s say that I can either Reduce that to 20 kg/day, or Re-source it using 100 kg of water. I think I would prefer having 100 kg of water on my site to 20 kg of solvent. (And then think about ways to Reduce the water). Of course, this example is an oversimplification and doesn’t take into account what I do with the solvent or water after I’m done cleaning my parts … but I think it does perhaps indicate that the heirarchy between Reduce and Re-source may not be so black and white. Thanks a lot for the feedback – much appreciated. I think it is a matter of definition or semantics…. by replacing the chlorine with water it could be argued that you have eliminated that particular resource altogether (e.g. “removed” chlorine) an action which is higher up the resource efficiency hierarchy. I guess I had intended the “re-source” to mean – “once I have reduced my need of resource x, how do I meet the remaining requirement for x in the most environmentally friendly way”….. I had intended “re-source” to be about meeting the residual need for an input x, not about substituting x with y. My bad for not making that clear! Thus in the example of electricity that I gave, I am assuming that my residual requirement could be “re-sourced” from a renewable resource instead of from a fossil fuel source. Clearly I could also consider changing the energy input from electricity to gas but that is a remove/reduce option insofar as electricity is concerned. Thus substitution of resource x with resource y is a way of removing or reducing resource x. In this case we need to make a judgement about the value and environmental benefits of y compared to x. That having been said I am sure that there are plenty of examples where the economic or environmental value of resource reduction methods don’t follow the hierarchy. The hierarchy is not a substitute for common-sense or experience because resource efficiency is much more complex than considering resource x in isolation. What the hierarchy can be useful in doing is to cause us to think through all the options in a structured way and not leap straight to the “easiest” end-of-pipe or “just buy renewables” type of approach….. Thanks again for you comment! I am one of those who have been around a few decades and remember when the hierarchy was first presented. Unfortunately, the hierarchy, having its place in discussion, and to promote public awareness, has been used to misrepresent responsible waste management planning where some now believe a society can actually operate without a landfill, which is the cornerstone of any cost-efficient waste management plan. Those that are operating without a landfill are paying a high price for it! And, who decides whether one person should be using an amount of a resource and another a different amount?